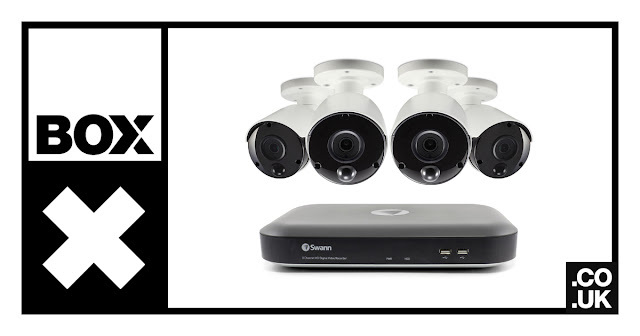 If you're thinking about protecting your home with security cameras, have you considered a Swann Security System? You can install them yourself but if you don't feel confident setting it up, why not take advantage of our time-saving and cost-effective installation service? We've teamed up with the Total Support Group (TSG) to offer a professional installation service, regardless of whether you need one camera or eight cameras to cover your property. The TSG engineers have the skills to install the latest systems, and set up remote viewing on phones and tablets, so you can view your cameras at anytime and anywhere in the world. Installation takes roughly one hour per camera and the experienced engineers are able to draw on their knowledge to advise on the best camera positions to ensure maximum coverage. It could not be simpler to get up and running, but which system suits your needs best? The first question to ask yourself is whether you want an NVR system or a DVR system - and unfortunately, it's not straightforward. DVR stands for Digital Video Recorder, whereas NVR stands for Network Video Recorder. In a nutshell, the main difference is that NVR systems require just one cable which provides power to the camera as well as sending the data back to the recording device. DVR is older technology and usually requires two cables - one for power and one for data. But, as it's an older technology, it is less expensive. Most people starting from scratch will choose an NVR system to help future-proof themselves but those who already have a CCTV system and are simply upgrading might prefer to stick with DVR technology as the wiring is already in place. With a DVR system you will need to use analog cameras. One of the advantages of these cameras is the technology used is less complex than an IP camera, meaning a low cost when looking to add more cameras to the system. As well as the coax cable which carries the data signal, the cameras will also need to be connected to a power cable which needs to be connected to a power source. That's something you will need to have installed if not already in place. Aesthetically it could also look untidy with a bigger hole needed for the cable to the camera with coax vs ethernet cable. Another thing to keep in mind with coax is the image quality can also deteriorate after 300ft/ 90m. However, for most home installs this is not an Issue as the distance from DVR to camera is less than 90m. The main reasons to go with a DVR system will be you are simply looking to upgrade an older system (such as 720p), to swap out the cameras and DVR, or budget is the main factor in your purchase. NVR systems use IP cameras which process the video footage and transmit to the recorder. They can all capture audio (if a microphone is built into the camera) as well as video and the more powerful hardware on IP cameras also enables improved smart functionality and video analytics, such as facial recognition. Rather than coaxial cables, IP cameras tend to use ethernet cables. The advantages here are that an ethernet cable also provides Power over Ethernet (PoE) meaning only one cable is required, ethernet cables (such as cat5e and cat 6) are easier to install because they're thinner and more flexible. As NVR recorders receive a pure digital signal from the cameras, video quality is better than compared to a DVR at the same resolution. The main reasons to go with an NVR System over a DVR system are for better picture quality, more flexible/easier installation, better support for audio at the camera, along with having the latest and greatest in a security system. Whatever your decision, if you're looking for a brand which delivers professional-quality security at a reasonable price, you can't go wrong with Swann. The brand is committed to manufacturing products which are industry leading in technology, easy to install and offer value for money. They have 30 years of experience protecting families, homes and businesses. Swann is a worldwide global brand in DIY video security with a presence in over 40 countries. Here are Box we stock a number of their leading security products, including a wide range of CCTV kits, cameras and accessories. See our full Swann range here, or speak to our team of experts about what is right for your home.